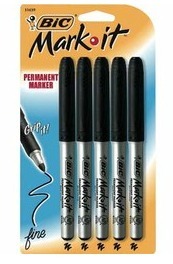 Free BIC Mark-It Markers at Staples Through 1/14 | A Savings WOW! With having four kids, one thing we’ve found very handy to have when we’re out and about are permanent markers. Why? It’s easier for us to keep track of the different kids’ drinks or other items if we use the permanent markers to put names or initials on them. Obviously, this is a great stock up price! Don’t forget to sign up for the FREE Staples Rewards Card so you can earn points towards rewards from your purchases. Find your nearest Staples store!